Imagine this for your next hike: no trailhead parking hassles or congestion, no trailhead pass required, lowering your carbon emissions, and saving on fuel expenses. There are now three transportation options for car-free hiking in the Gorge. NEW! Visit the Car-Free Gorge microsite, a one-stop resource to learn the best options for exploring and getting to and from the Gorge car-free. In Skamania County, the West End Transit (or WET Bus) will resume full service again in 2018 on summer weekends to nine trailheads and Gorge communities. With connections to TriMet and C-TRAN, weekend day and overnight trips to the Gorge from Portland and Vancouver, WA are a reality. View spring 2018 schedule. Leashed or well-controlled dogs are allowed on the bus. Bikes can be accommodated on the two-bike carrier or with additional bike storage inside the bus. Free wi-fi; instagram your adventure from the road! 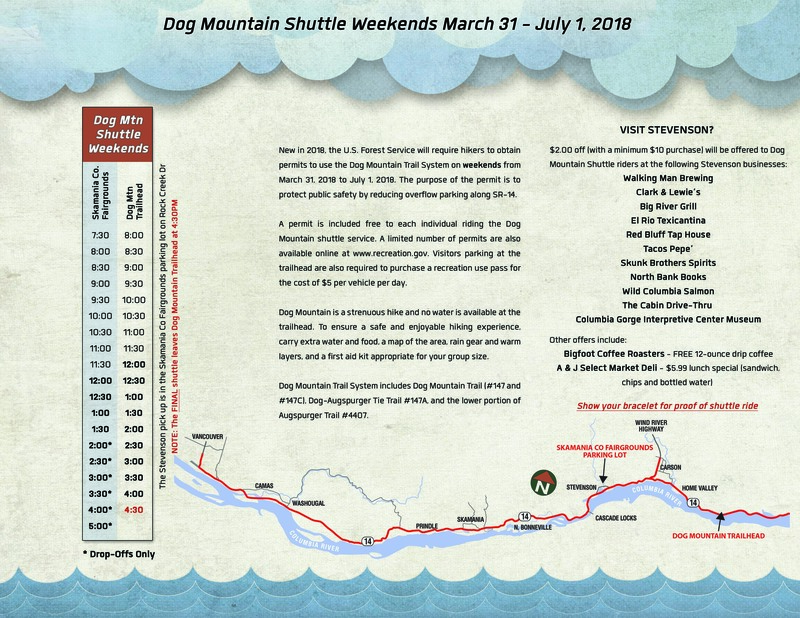 The Gorge WET Bus 2018 seasonal transit service will begin with a Dog Mountain shuttle program. Due to the safety issues at Dog Mountain and a new Forest Service required permit, the WET Bus will shuttle visitors on Saturday and Sunday from March 31-July 1. The shuttle will start at 7:30 a.m. located at the Skamania County Fairgrounds parking lot located on Rock Creek Dr. in Stevenson. The shuttle will run every 30 minutes with the last return trip from Dog Mountain Trailhead leaving at 4:30 p.m. The fare is $1 each way. With the increased visitation to Dog Mountain and the safety concerns with hikers parking and walking along SR 14, the U.S. Forest Service is introducing a new permit system at the Dog Mountain trailhead on weekends during peak wildflower season. Hikers can obtain a permit online at www.recreation.gov or by riding the Dog Mountain Shuttle (see below). Shuttle riders will be given a free permit/wristband. Friends is a partner in offering this transportation option; grant monies funding this service are provided by Washington State Department of Transportation, Skamania County and Stevenson Lodging Tax Grants. For a complete bus schedule, visit the Skamania Transit Facebook page or call Skamania County Senior Services at 509-427-3990. Travel by bus to Dog Mountain trailhead where your adventure starts long before you hit the trail! In Oregon, from May to September the Columbia Gorge Express will take riders from Portland to Cascade Locks and Hood River in addition to Rooster Rock and Multnomah Falls. Friday, Saturday, Sunday and holiday service begins Friday, May 25, and daily service kicks off June 11. The bus takes riders on Friday, Saturday, and Sunday from Gateway Transit Center to Multnomah Falls and back for $5 round-trip. The bus departs Gateway Transit Center 11 times each day and the bus departs every 10-40 minutes from Rooster Rock State Park. Riders are strongly encouraged to puchase tickets online in advance. Gorge Towns to Trails links Gorge communities with outdoor recreation. When you take the bus to a hike, you’re keeping Gorge roads congestion-free by using transportation options.